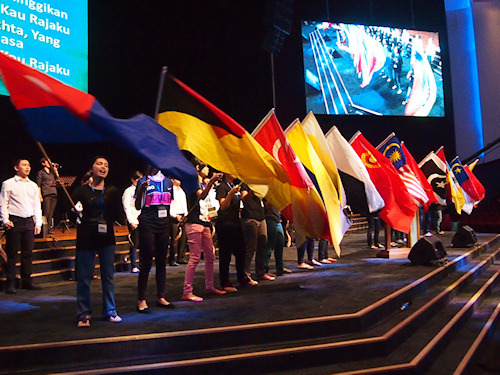 WE love Malaysia and we intercede for her. And in her 50th year of Jubilee, we pray for God's blessings on our land. But what is prayer that moves mountains? 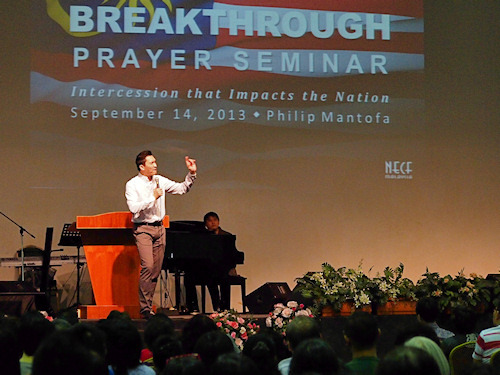 What is intercession that will really move the hand of God, asked evangelist Pastor Philip Mantofa, when he spoke at the Breakthrough Prayer Seminar on 14 Sept.
"When you pray for Malaysia, pray sacrificially. No intercession can be done without sacrifice. You have to be willing to be jailed or to die for the nation. ... Otherwise, our faith is just carnal and our prayer, mere talk," he said. Mantofa speaks from experience. 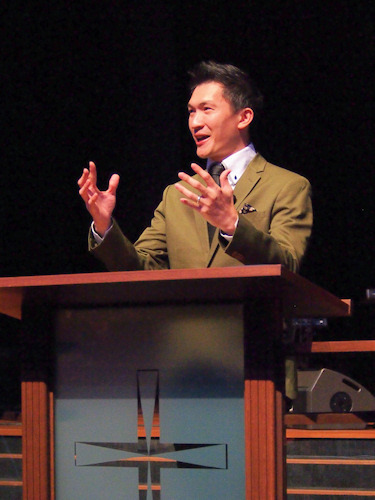 In his personal story well-known to those familiar with his preaching, he gave up a secure and comfortable life in Canada and returned to Indonesia, in its darkest, "most hellish" hour during the May 1998 riots. What began as anti-government protests had turned into anti-Chinese and anti-Christian violence. The turmoil began bubbling long before rioting broke out, but Mantofa had been convinced by the Holy Spirit to return to his homeland at a time when thousands were fleeing. Mantofa, 39, is now Vice Head-Pastor of Gereja Mawar Sharon, Indonesia, which has 30,000 members in 70 local congregations. Over Malaysia Day weekend, he was here to speak at the seminar, held at Full Gospel Tabernacle, and at the Malaysia Jubilee Prayer Celebration at Calvary Convention Centre on 15 Sept. 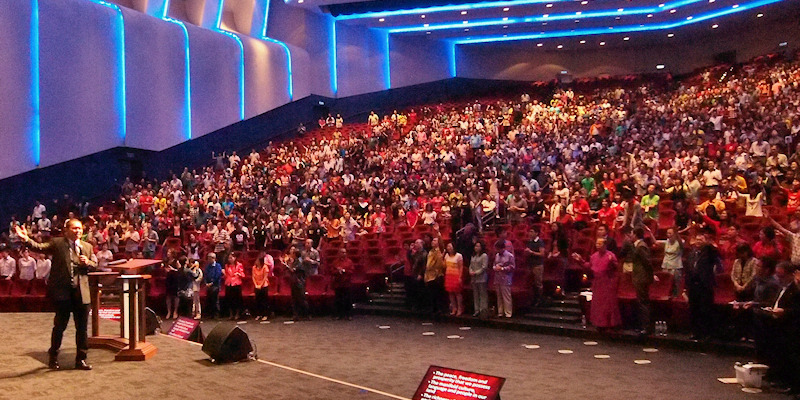 The seminar was attended by more than 600 people and the prayer celebration by about 3000. Recall and cling to what God has said (v 6-12). Caleb, at age 85, still remembered what God had promised 45 years earlier. Likewise, intercessory prayer must be patient and persevering. Hold fast to the God's promises for Malaysia and intercede till they come to pass. The passing of time and cares of this world can dim our memory of what God has said, and new prayer "trends" or topics can serve to distract. But to remember and persevere in what God has promised is to be spiritually responsible. Do not desire to be "spiritually mighty"; that will follow once we are spiritually responsible, Mantofa said. Renew your strength (v 11-12). Caleb still felt as young and as vigorous as ever despite his old age because his reality was rooted in the promise of God's word. Is our reality in the discouraging circumstances afflicting our nation or is it rooted in God's plan and purpose? With these principles on intercessory prayer in place, he then spoke on reviewing or strategising our approaches in ministry and outreach. At the Jubilee Prayer Celebration, Mantofa preached from 2 Kings 4 on the widow who feared that her husband's creditors would take her sons away into slavery. Likening the Church to the widow, Mantofa said our prayers and intercession for Malaysia must also cover our sons and daughters - the next generation of citizens. "You don't want a revival that will only last a few years but you want it for the long term," he said. He also cautioned the Church not to come up with excuses like the widow did that prevented her from stepping out in faith (v 2). "We sometimes have the spirit of poverty the widow had, focusing on what we lack rather than what we already have and using our lack as an excuse." And finally, to remember that miracles - in the widow's case, the multiplication of oil after collecting empty jars from all her neighbours - are not simply for the purpose of solving our problems alone but as a witness to the surrounding community. In order for the neighbours to hand over their jars to the widow, she would have had to explain her predicament and Elisha's instruction. 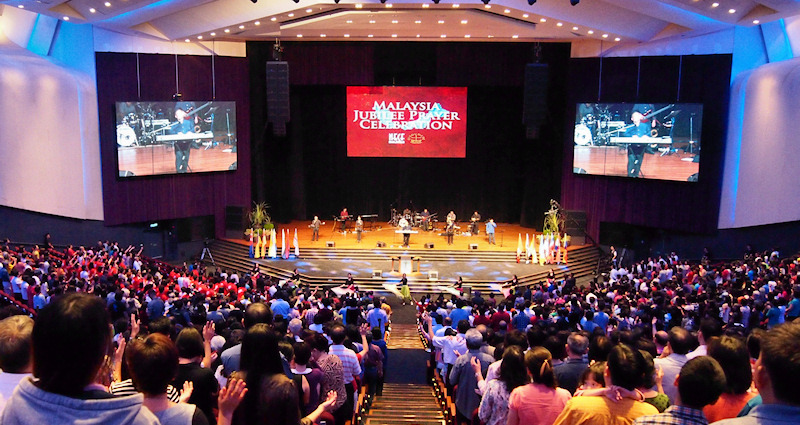 The prayer celebration was a historic moment for Malaysia's churches. Not only was it the nation's 50th year and Jubilee year but it was significant for the unity of evangelical and mainsline denomination churches as the event was jointly organised by the Council of Churches Malaysia and NECF. The celebration closed with prayers of thanksgiving, for the nation, for the church and the government led by Pastor Dr Khoo Kay Hup of FGA KL, Pastor Edwin Agong of SIB Brickfields, Rev Ooi Liang Hung of Sri Petaling Chinese Methodist Church and Rev C Jayaraj, President of the Tamil Annual Methodist Conference. A declaration to bless Malaysia was read out by Rev Ong Sek Leang, the General Superintendent of the Assemblies of God Malaysia. Present were the bishops of the various mainline churches, elders and pastors of charismatic and evangelical churches, and some Christian Members of Parliament. Minister in the Prime Minister's Department in charge of National Unity, Tan Sri Joseph Kurup, and Senator Datuk Paul Low, Minister in the Prime Minister's Department, were the guests of honour at the prayer celebration.